With its skyscraping mountains reaching up from dry, cracked desert, Mongolia is inherently cinematic. Surprisingly, its films are not. From what I have seen, they are small, intimate stories - not the sweeping epics I was expecting given Mongolia's breathtaking landscape. The landscape plays a large part in underscoring the characters' feelings of hopelessness and isolation. In this big world, their spirits can soar or become completely lost. In the case of Tuya's Marriage, the main character's spirits have difficulty taking flight... as they should. Tuya, a woman struggling to provide for her family as a sheep herder, is in quite the dilemma. Her husband is disabled and she has to find another one to help her take care of him. Her suitors, of course, want nothing to do with him. These circumstances are sympathetic despite being bizarre. Kudos to director Quanan Wang for challenging the audience in the end. The ending of Tuya's Marriage reminded me of the conclusion of the Coen Brothers' A Serious Man in its refreshing refusal to give easy answers or provide a tidy resolution. Like A Serious Man's Larry Gopnik, life never seems to go right for Tuya and by the end, there is very little hope that it ever will. I must admit that I was not nearly as affected by the ending of Tuya's Marriage as I was by A Serious Man however. Maybe that's because when I saw this bleak Mongolian film, I was snug at home, allowing pleasant thoughts to easily dance through my head. When the lights in the theater came up after A Serious Man, no one spoke or moved. They were too shaken from staring into the abyss; being confronted with ambiguity and their worst fears. The movie theater allows for that kind of powerful illusion, aesthetic distance as it is called. 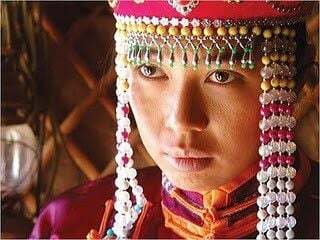 Therefore, I recommend that you see Tuya's Marriage at the IMA's Toby Theater Friday, Dec. 10 at 7 p.m. Don't get the DVD. Spend the $9 on a more hypnotic, powerful experience.